Measured success Evaluating the effectiveness of Hills DT spinal decompression therapy. MORE THAN 31 MILLION AMERICANS EXPERIENCE LOW back pain at any given time and 80 percent of the population will experience this problem in their lifetime (Forer, 2012). But the surgical option for treating low-back pain often has postoperative complications (Street et al., 2011). In Singapore Chiropractic care offers a nonsurgical approach that uses various treatments such as spinal decompression therapy. In a recent study (Gionis and Groteke, 2012), researchers found that 86 percent of patients completing decompression therapy reported resolution of their symptoms. This article details a recent outcome study (Blumke, 2014) completed by a Davenport University health information management intern at a chiropractic centre in West Michigan providing spinal decompression treatment. The treatment program described as follows was found to be highly successful with little to no post-treatment complications. In health information management programs, students participate in real life activities associated with a healthcare organisation to apply their acquired knowledge. In this case, the student project included documentation review, data collection, and analysis. Under the supervision of a doctor of chiropractic, the intern was given access to patient records dating from 2011 to 2014. To track satisfactory rates for the Hills DT spinal decompression treatment provided in the facility, the electronic health records of 163 randomly chosen patients were examined to record date of treatments, gender, chief complaint, and diagnosis. A section for comments was included from each patient to record medical history, nature of the onset, exacerbating factors, and pain indices throughout the treatment plan. The demographic profile of the patients evaluated was fairly uniform, with a slight majority of women (54 percent) over men (46 percent). The chief complaint listed revealed that over 50 percent of the sample reported some sort of lower back pain. The remainder of complaints comprised such conditions as neck, shoulder, hip, leg, and foot pain. The clinical evaluation showed a success rate of slightly more than 90 percent, with success defined as patients being “satisfied” or “very satisfied” with the outcome of their treatment. Of the 163 patient charts examined, only 14 patients were classified as “not satisfied” or having deemed the therapy unsuccessful. Four of those patients discontinued their care to seek alternative treatment; namely, a surgical option in an attempt to minimise pain that was not responding to nonsurgical spinal decompression. The majority of the patients reported looking forward to receiving care because of the positive results of their treatment, and many were able to avoid surgery. After treatment, patients reported feeling better with minimal pain and overall felt optimistic about receiving chiropractic care. The results of this evaluation exceed the expected outcomes for chiropractic care. Statistical evidence shows that throughout the U.S., more than 75 percent of patients are satisfied with the end result of their chiropractic care (Blumke, 2014). In this evaluation, 91 percent of patients who complained of pain in their back or neck were pleased with their nonsurgical spinal decompression outcome. An effective spinal decompression treatment program consists of five components that lead to positive patient outcomes. 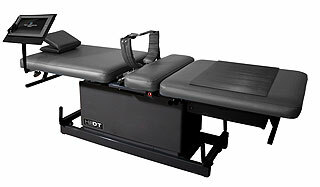 First is a decompression treatment table. There are many on the market but not all are equal in quality. Look for a table made by a well-known manufacturer and study any reviews available. Speak with doctors who are using the table to verify the results they are achieving with patients. Read the fine print on warranty and support. Be sure there is a training or certification process so that you understand the technology and how it works. Second is a pre-decompression treatment protocol such as infrared, laser, heat, or similar therapy to prepare the tissue for the decompressive event. The secret to decompression treatment is that it addresses the biomechanical aspects of disc disease. By creating a phasic physiological change in the spine, the body can repair damaged tissues and the real healing can begin (Aimbire, 2006; Bjordal, 2003; Guehring, 2006). The third component is nutrition. Look at the patient’s pro-inflammatory diet as a possible cause for their pain and inflammation. This is an often overlooked but critical component. Nutritional recommendations may include dietary change or supplementation, but the chemical mediators that are at work in the patient must be addressed. The fourth component is posture rehab or exercise therapy. Endurance and stability of the muscle groups supporting the trunk, neck, and head are vital to long-term improvement in spinal function. Many approaches are available including the use of medicine balls, floor exercises, or passive and active physical therapy (Nelson, 1999). The fifth component of the treatment plan is spinal chiropractic manipulative treatment (CMT). For doctors of chiropractic, CMT is the preferred treatment for patients along with treatment to restore spinal function, reduce pain, and resolve ongoing disability. Recent studies suggest that CMT alone can play a significant role in the regression of disc herniation and resolving radiculopathies associated with degenerative disc disease (Forbush, 2011; Keeney, 2013). This clinical evaluation of the efficacy of spinal decompression treatment (Blumke, 2014) revealed some notable outcomes and data. An overall successful outcome of 91 percent was seen in cases that had undergone a nonoperative axial spinal decompression treatment plan. Previous studies have suggested the success rate for spinal decompression treatment to be between 53 and 86 percent (Beattie, 2008; Gose, 1998; Odell, 2003). The practice integrated the five elements of spinal decompression therapy described in this report. These five elements, if applied consistently, can provide patients with successful outcomes. The authors recommend trying them out in your own practice. Begin to integrate pre-decompression therapy with your decompression treatment, add posture rehab, nutritional recommendations, and CMT. Over the last 10 to 15 years, many doctors of chiropractic have successfully integrated decompression treatment into their practices. Patient outcomes have ranged from poor to great. The doctors who are achieving successful outcomes for their patients, however, have truly “cracked the code” on decompression treatment. They understand that the technology of the table as well as the method in which the care is administered are important. Ultimately, the practitioner must follow a treatment protocol that is safe, cost effective, repeatable, and has measurable results. The success rate of spinal decompression treatment as noted in this evaluation and the cited studies is especially remarkable when compared to the risk factors for surgical treatment of the same or similar conditions (Street et al., 2012). Why, then, aren’t more chiropractors adding this important treatment option to their practice? Doubts regarding the effectiveness of decompression treatment should be allayed by these findings. Hills DT Spinal decompression treatment is demonstrably an effective, nonsurgical method for treating patients with neck and low back pain within Singapore Chiropractic. For spinal decompression Singapore is starting to turn towards more conservative approaches and we are here to help.